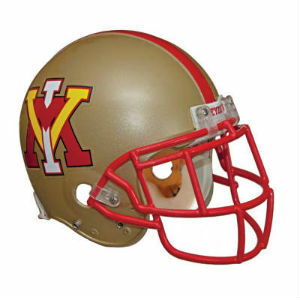 The Keydets conducted a two-hour workout Saturday at Fiorini Field that featured all live plays under overtime conditions. Using a special scoring system, the defense prevailed over the offense, 37-24. The defense held the upper hand early in the scrimmage stopping the offense from attaining a score on the first three possessions. Field goal attempts from 27, 47, and 42 yards were all unsuccessful which piled up early points for the defense. Pass breakups by freshman defensive back Tyriuq Trotman and sophomore defensive lineman Daniel Rader keyed the defense. The offense got rolling in possession number four and scored quickly in three plays. Rising redshirt junior quarterback Al Cobb connected on an underneath pass to senior receiver Darrian Johnson for a five-yard gain to open the drive, then hit senior receiver Aaron Sanders for an 11-yard gain. One play later, senior running back Alex Keys scored on a 9-yard burst to put the offense on the board. Following a 23-yard field goal by Dillon Christopher to cap the ensuing drive, Cobb connected with junior tight end Ryan Swingle for an 8-yard touchdown pass, but the two-point fade pattern pass to Sanders was incomplete. The defense rallied on the next two possessions as Christopher missed a 22-yarder from the right hash on the next drive. One drive later, a takeaway was generated as junior defensive back John Strozyk tipped a Cobb pass at the goal line which was snatched by sophomore defensive back Michael Williams and returned 50 yards. Keys, auditioning for a spot at running back after playing his first three seasons in the secondary, capped the scrimmage scoring with a one-yard TD rush. Other defensive highlights included a quarterback sack by sophomore defensive lineman Xavier Greenfield (six yards) and tackles-for-loss by inside linebackers Allan Cratsenberg and Ryan Francis. Field goal kickers were just a combined one for five in the scored part of the scrimmage. Three penalties were called, two pre-snap infractions on the offense and a defensive holding citation on a two-point attempt, which led to a successful two-point run by freshman quarterback Austin Coulling on the final snap of the scrimmage.